This is a great Puna hike to a beautiful and seldom-visited sandy beach. This Nā Ala Hele trail travels a portion of the historic Alanui Aupuni (Old Government Road) from the 1800s. Even earlier, the ancient Hawaiians pioneered a trail through this part of the island. The reward for this hike is Hā'ena Beach, a white sandy crescent of safety on a coastline that is usually harsh lava cliffs. Hā'ena is also known as Shipman Beach because W.H. Shipman Ltd. owns all of the land behind the beach. This private land is also the reason you cannot drive to this beach. 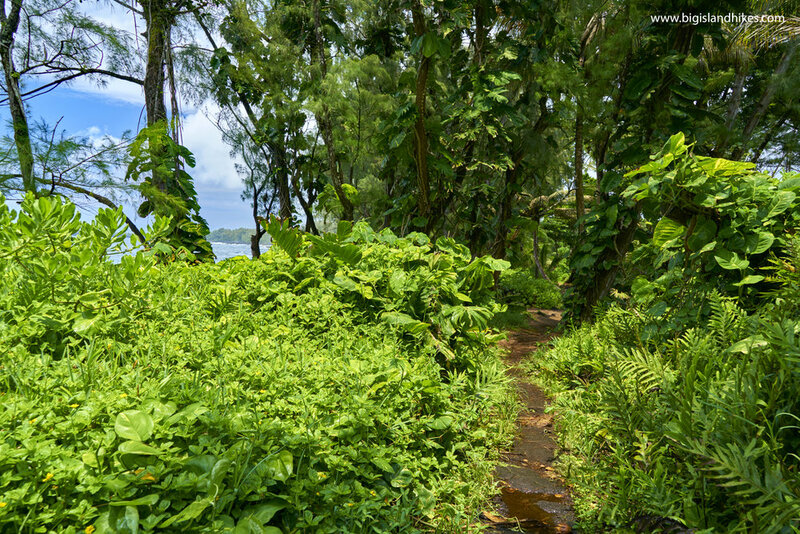 The official Nā Ala Hele trail cuts inland toward Hā'ena, but it is also possible to hike along the coastline off-trail for variety or to do a loop hike. 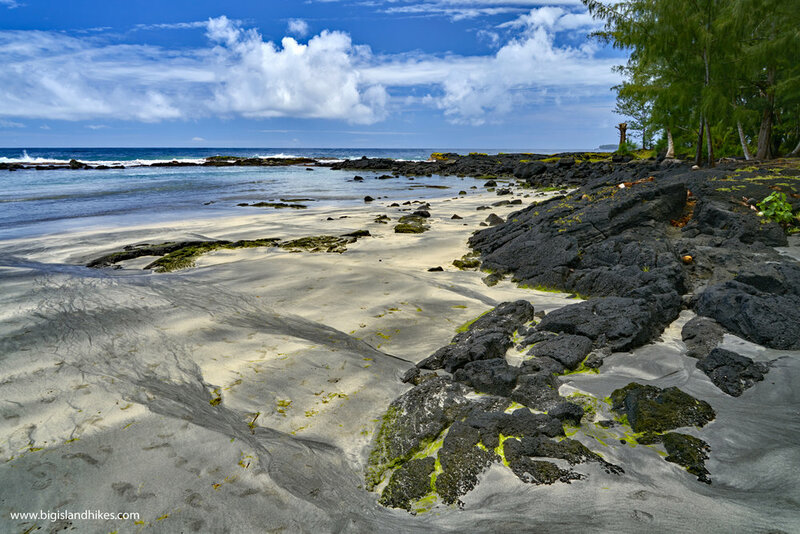 Hā'ena Beach is protected by a lava boulder reef and is very shallow. So, it's not the best for swimming or snorkeling, but is a wonderful spot for a lazy beach day. Although most of Hā'ena is shallow and safe (especially for the keikis), strong currents have led to several deep sea rescues from swimmers dragged out of the small bay. There are no facilities at Hā'ena Beach, so plan accordingly to Leave No Trace. This trail can be extremely muddy if it's been raining a lot recently. Dogs must be kept on leash at all times on the trail to protect endemic wildlife, including many nēnē. There is no camping. Trailhead: South of Hilo, drive Hwy. 130 to the Hawaiian Paradise Park subdivision and turn makai (toward the ocean) on Kaloli Drive. Follow Kaloli Drive for several miles until it dead-ends into Beach Road. Take a left and follow Beach Road until it ends shortly in a gravel parking area ringed by large boulders with an information kiosk. The trailhead has no facilities. It is open from 8am to 5pm. 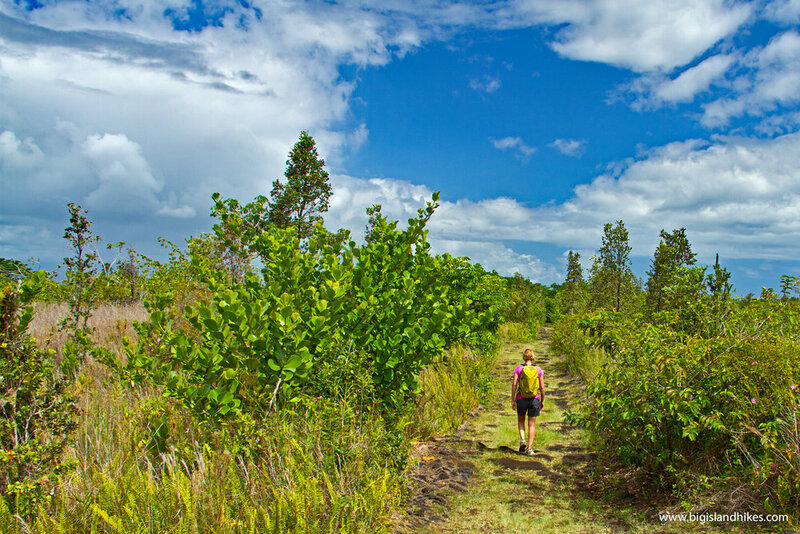 Gear: This is a moderate hike through a coastal rainforest. The trail can be very muddy so waterproof boots might be a good idea. Bring plenty of water and sunscreen and don't forget the mosquito repellent. You'll want beach gear for Hā'ena Beach at the end of the hike. Hike: From the parking area, hop over the boulders and hike northwest on the obvious Puna Trail. The beginning of the trail is exposed and offers big views inland if it is clear. Keep an eye out for wild orchids. Quickly pass a tree tunnel into deep rainforest. Around the trail here is the ancient village of Keauhou. Stay on the trail and view the ancient site from afar -- it is private property. You'll eventually pass over a collapsed lava tube, visible on both sides of the trail. The next ancient site you encounter was the Kea'au School from the 1840s. You should be able to see the ocean through the trees at this point. As you near the end of the hike, you'll find a plateau near the shore that had been cleared and leveled in the past. This is Hā'ena, an ancient site of great importance where some hula traditions arose. After this site, you'll be hiking next to a rock wall marking private property. If you keep your eyes peeled, you'll notice a poured concrete bunker "pill box" from World War II when the Puna Coast was fortified against possible invasion. After a bit more, you'll encounter Kea'au Bay and beautiful Hā'ena Beach. The rock wall behind the beach marks private property. There is a rock and coral reef offshore that protects the bay and creates brackish conditions inside. The beach is a great spot for hanging out, but not really ideal for swimming or snorkeling as the protected portion of the bay is only about 3-4 feet deep uniformly. Try to find small sinkholes in the surf from the freshwater. Be aware that dangerous conditions exist near the rock and coral reef and many people have been rescued from the deep blue sea beyond Hā'ena. Stay nearer to the beach and watch for rogue waves coming over the reef. The beach is great for keikis (kids) with proper supervision. There is no lifeguard here and no facilities. After you've enjoyed Hā'ena, you can either return the way you came along the Puna Trail or do a loop following the coast off-trail. If you'd like to follow the coast, simply walk along the sea cliffs paralleling the Puna Trail. This coastline is very dangerous, and you should respect the raw power of the waves here. Stay away from the edge and never take your eye off the ocean. Hike 2.5 miles and find a fisherman's 4WD road/trail heading back to the trailhead parking. There is a maze of old trails and roads in this area, and the right way is sometimes difficult to determine. If you'd like some more hiking, instead of heading back to the trailhead parking, continue along the coast to Kaloli Point. This spot is popular with fishermen and offers huge views north and south along the powerful Puna coast. This extra leg adds 2 miles to your day.